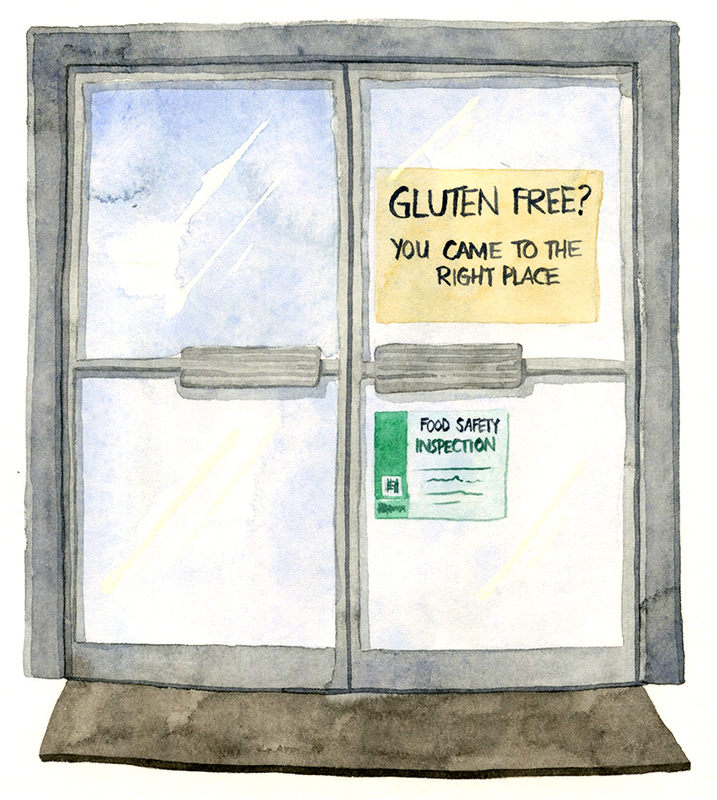 If you think somewhere is gluten free, but it's not listed here, you can email me. Some places have gluten free items that I would NOT recommend for someone with an allergy or celiac disease. Alternatively, maybe I have missed somewhere and would be happy to add a new place to this list! Chuck's Burgers are gluten free. You can't find it on the website, and nobody replied to my email asking about it, but they do also have a gluten free deep frier. They have gluten free buns, but frankly... I've found the buns disappointing. They kind of crumble to bits after the first bite. Still, it's awesome to have a burger (out of the house!) and the fries are amazeballs. Kind of like Swiss Chalet fries. I think the menu contains sweet potato fries, but unfortunately, those are no good for celiacs (wrong fryer). I recommend: trying a crazy burger combo. You can choose your toppings and what kind of burger (lamb, bacon, beef, etc). And the fries. Of course. I haven't eaten here since I was diagnosed but I have heard good things from a fellow Celiac (Thanks, James!). I promise to update this once I know more. I've posted about this one before, but here it is for the record! They have freshly roasted coffee, lots of drinks, and some gluten free baked items that normally I can't eat because they are too close to gluten items for my liking. However, they will make you up a gluten free meal, and seem pretty well versed on contamination issues. I recommend: All day breakfast with gluten free toast and some freshly roasted espresso beans. This place is amazing! For gluten free mexican food, you can't beat Mex-i-can. Most items are gluten free, and made in house (even the corn tortillas). Avoid items in wheat tortilla shells, for obvious reasons, but don't worry about contamination because they don't make the wheat shells in house. Also, I must have eaten here more than 30 times and I've never gotten sick. The staff are super friendly, and they always remember my food preferences. The atmosphere is distinctly NOT on the fancy side, but the food comes in large portions. I recommend: getting a main dish instead of the appetizer versions because the bean dip and rice are delicious, the quesadillas, the flautas, and also everything else. You can have the tortilla chips and the sauce they bring to the table, so knock yourself out. Valentino's is Italian food. I've only been once, but it was super yummy and filling. I got the gluten free pasta, because the waitress recommended that for people with serious food allergies, the pizza oven might not be safe enough? Has anyone else tried the pizza? They also have gluten free gelato. They scraped the top layer off the gelato, just in case any gluten had fallen in it, so you can also ask for that. I recommend: The gelato. Ah-mazing. Off The Hook, if you are in Stoney Creek, is a great option for all the deep fried stuff you haven't been able to get since you went gluten free. They have a dedicated gluten free deep fryer, as well as a separate area of the grill for gluten free grilled fish. They are pretty well versed on contamination issues, and I haven't ever gotten sick from eating there. They also have gluten free poutine, gluten free onion rings, and a really awesome bottled root beer that is gluten free. Don't eat the little candies that come with the bill, they aren't contamination free. I recommend: frings (half onion rings, half fries), the bottled root beer, and "lost in the sauce" garlic sauce for dipping. I've only been here once, but it was delicious. I have big plans to go back. They have gluten free pizza and gluten free pasta. I got the pizza, with a gluten free crust. I did carefully explain about contamination to the waitress, but the kitchen staff seemed to have no problem accommodating my needs. Also, the manager (I think?) came by the table, explained that his mother has celiac disease and that the kitchen staff took every care to make my meal as contamination free as possible. I recommend: The pizza. They let me mix and match the toppings, although that wasn't an option on the menu. It's a thin and crispy crust, just the way I like it! Imagine my surprise when I heard about this one! Most chains have a really terrible way of treating people with food problems but I've eaten at this Jack Astor's three times without getting ill. You can ask the staff for details on what is available, and if there are questions, they can print out a kind of receipt with all the listed allergens for every dish. We found that helpful, because we could go through and cross off or write notes on what to remove before ordering. I recommend: The nachos (we had them remove the cheese sauce, not because it had gluten, but because cheese sauce is nasty), and the pad thai. The Keg has served me faithfully many times. Usually upon arrival you ask to speak to the manager, who will bring you an allergy guide/menu breakdown and sometimes a kitchen manager/chef. Depending on the size and newness of the Keg, they will have a separate prep area for allergies as well as maybe a deep fryer? Either way, you can get a steak and twice baked potato, no problem. Just watch for the nachos (Keg nachos! So good! Agh! ), because the chips are made in house, and then you have to watch for the deep fryer. Also, the bacon bits are gluten free. I recommend: Twice baked potatoes, steak and creme brulee. So that's all for now! I expect I will be updating this fairly soon, as new places seem to open every week! Definitely let me know if you have any additions or warnings about certain places - The more we all share, the better!